Setting Data were collected in a tertiary medical centre, located in Shanghai, China, from September 2011 to May 2017. Participants 338 pregnancies with SLE were analysed retrospectively. Cases of multiple pregnancy and those in which artificial abortion was performed for personal reasons were excluded. Primary outcome measures Fetal loss was the primary outcome. A stepwise regression to identify the predictors related to the fetal loss and coefficient B of each variable was used to develop a predictive model and make a corresponding risk classification. The Hosmer-Lemeshow test, Omnibus test and area under the receiver-operating characteristic curve (AUC) were used to assess the goodness-of-fit and discrimination of the predictive model. A 10-fold cross validation was used to assess the model for overfitting. Results Unplanned pregnancies (OR 2.84, 95% CI 1.12 to 7.22), C3 hypocomplementemia (OR 5.46, 95% CI 2.30 to 12.97) and 24 hour-urinary protein level (0.3≤protein<1.0 g/24 hours: OR 2.10, 95% CI 0.63 to 6.95; protein≥1.0 g/24 hours: OR 5.89, 95% CI 2.30 to 15.06) were selected by the stepwise regression. The Hosmer-Lemeshow test resulted in p=0.325; the Omnibus test resulted in p<0.001 and the AUC was 0.829 (95% CI 0.744 to 0.91) in the regression model. The corresponding risk score classification was divided into low risk (0–3) and high risk groups (>3), with a sensitivity of 60.5%, a specificity of 93.3%, positive likelihood ratio of 9.03 and negative likelihood ratio of 0.42. Conclusions A predictive model for fetal loss in women with SLE was developed using the timing of conception, C3 complement and 24 hour-urinary protein level. This model may help clinicians in identifying women with high risk pregnancies, thereby carrying out monitoring or/and interventions for improving fetal outcomes. This study developed a prediction model and risk score classification for systemic lupus erythematosus fetal loss. The model of prediction has a good fit and discrimination, as does the risk score classification, indicating a higher predictive value. The risk score classification is clinically practical, as the model is simple and the variables included are routinely collected during the first antenatal care visit. The limitation of this model was the development and validation process applied the same cohort. Although 10-fold cross-validation was performed and had a good result, it still cannot assess the generalisability of this model. Systemic lupus erythematosus (SLE) is a multisystem autoimmune disease, and it primarily affects women of childbearing age. Women with SLE have normal fertility rate,1 and pregnancy is therefore a frequent subject of interest to these patients. Adverse pregnancy outcomes are common in this population, with an estimated 20% ending in miscarriage and 3% in stillbirth.2 As the treatment of SLE has greatly improved over the past two decades, the majority of SLE women can carry out a live birth delivery.3 Prediction of pregnancy outcomes for patients with SLE can significantly contribute towards providing effective preconception consultation and treatment as well as prevent adverse pregnancy outcome and complications. Advice about safety and timing of conception requires identification of clinical and laboratory variables that predict fetal loss and other adverse pregnancy outcomes.4 While numerous studies have identified risk factors for fetal loss in pregnant women with SLE, such as lupus nephritis,5–7 SLE activity during 6 months before pregnancy,8 low complement levels,9 antiphospholipid syndrome, anti-SSA/Ro antibodies, thrombocytopenia10 and many other factors have been introduced in previous studies,11–17 results varied among studies. The numerous risk factors and the complicated relationships among these factors necessitate the development of a clinical prediction model. It is essential and helpful if the clinician is able to predict the risk of fetal loss in pregnant patients with SLE in the early stages of gestation, which can allow special monitoring and treatment as early as possible. Application of prediction model in pregnancy has been studied for years15 18; However, very few studies4 19 have proposed such a predictive model or risk score in predicting the fetal loss risk in SLE women. We therefore conducted a retrospective study at a tertiary hospital in Shanghai, China and sought to identify clinical and laboratory predictors for fetal loss in pregnant patients with SLE to develop a risk score and classification. Baseline characteristics of interest included maternal age at delivery, region, parity, the history of spontaneous or therapeutic abortions. Regions were categorised as either urban or rural areas. Clinical information included SLE clinical features and laboratory information from the first antenatal care records (16–20 weeks). Comorbidities included a pre-pregnancy diagnosis of hypertension or diabetes. No women in the study population were smokers or drinkers, so lifestyle (eg, smoking and drinking) was not analysed in this study. With respect to different timings of conception, patients were divided into a planned pregnancy group, which consisted of patients who had controlled SLE or were in remission for more than 6 months prior to conception and an unplanned pregnancy group, which consisted of patients with active lupus disease before conception or new onset SLE during pregnancy. SLE Disease Activity Index 2000 (SLEDAI-2K) was used as a valid measure of disease activity and SLEDAI-2K>4 was defined as an active stage of SLE.21 Laboratory data included a complete blood count, urinalysis, serum albumin, 24 hours urinary protein, complement 3 (C3), complement 4 (C4), antinuclear antibodies, anti-dsDNA antibodies (anti-dsDNA), anti-Smith antibodies(anti-Sm), anti-SSA/Ro antibodies, anti-SSB/La antibodies and antiphospholipid (aPL) antibodies, which included anticardiolipin antibodies (aCL), anti-2-glycoprotein I antibodies (anti-β2GPI) and lupus anticoagulant (LA). All laboratory tests were performed using standardised methods. Live birth: the birth of a living child. Preterm birth: delivery prior to 37 weeks of gestation. Low birth weight (LBW): birth weight ≤2500 g, regardless of gestational age and circumstances.22 LBW infants were divided into term LBW and preterm LBW based on their gestational age. Spontaneous abortion: spontaneous termination of pregnancy prior to 28 weeks of gestation. Therapeutic abortion: abortion for therapeutic reasons because the pregnancy might be a threat to maternal health, such as life-threatening SLE flare23 or other severe obstetric complications, including severe thrombocytopaenia or HELLP (haemolysis, elevated liver enzymes, and low platelet count) syndrome and so on. Patients and the public were not involved in the design and conception of the study and there are no plans to disseminate the results to patients. Descriptive data are shown as the mean±SD or as a frequency. Categorical variables were analysed using χ² or Fisher’s exact probability tests as appropriate. Continuous variables were analysed using Student’s t test where the distribution are normal. BV=regression coefficient B of each variable. A cumulative risk score was calculated for every patient.28 ROC curves were plotted, with 1–specificity and sensitivity measured along the horizontal and vertical axes, respectively, with all possible cumulative risk scores in all patients used as cut-off points in the prediction of fetal loss in pregnant patients with SLE. Sensitivity, specificity, accuracy, positive predictive value, negative predictive value, positive likelihood ratio and negative likelihood ratio were used to find the best cut-off of the scoring system. All tests were two-tailed, and p<0.05 was considered statistically significant. All analyses were performed using SPSS V.22.0 and R Studio V.3.4.1. The research protocol used in this study was reviewed and approved by the Ethics Committee of Ren Ji Hospital, Shanghai Jiao Tong University School of Medicine (2017–113). As this was a retrospective observational study, the Medical Ethical Committee granted a waiver for informed consent for this study. Approval to obtain clinical data from the database was received from the office of the medical director of the hospital. All patient information was kept confidential. A total of 338 pregnancies with SLE were included in this analysis. Their baseline characteristics are shown in table 1. The mean age at conception was 29.5±4.0 years (range, 20–40 years), and the mean time between SLE diagnosis and pregnancy was 5.7±4.3 years (range, 0–20 years). The frequency of therapeutic abortions ranged from 0 to 2 times, and the frequency of spontaneous abortions ranged from 0 to 7 times. Almost 70% of the pregnancies with SLE were from urban areas. Of the patients, 291 (86.1%) were nulliparous. With respect to comorbid conditions, only 1 patient had pre-pregnancy diabetes (not shown in the table) and 10 patients had pre-pregnancy hypertension. There were 293 (86.7%) planned and 45 (13.3%) unplanned pregnancies. The most common SLE clinical manifestations were mucocutaneous lesions, which were identified in 31.4% of patients. The mean 24 hour-urinary protein level was 1.04±2.43 g (range, 0.01–16.69 g). Forty-six patients were positive for aPL antibodies. C3 and C4 hypocomplementemia was present in 90 (26.6%) and 60 patients (17.8%), respectively. A total of 300 live births (88.8%) and 38 fetal losses (11.2%) was recorded. Eighty-six pregnancies (25.4%) were preterm births, and 68 neonates had LBWs (including 13 full-term births). Among the pregnancies that ended with a fetal loss, 11 (28.9%) were spontaneous abortions, 21 (55.3%) were therapeutic abortions and 6 (15.8%) were stillbirths. There were four live births with congenital malformations, of which one had small atrial septal defect, two had renal problems and one had polydactyly. There were no neonatal deaths (online supplementary table S1). The association between each potential predictor and the risk of fetal loss was statistically significant. A 24 hour-urinary protein level ≥1.0 g/24 hours had the highest OR at 14.85 (95% CI 6.25 to 35.31), followed by C3 hypocomplementemia (OR 11.43, 95% CI 5.15 to 25.33). When all potential predictors were included in the model, only 24 hour-urinary protein ≥1.0 g/24 hours and C3 hypocomplementemia remained statistically significant. This was likely because of the relatively high correlation between potential predictors. A Spearman correlation was performed, and the result is shown in online supplementary table S2. Using a stepwise regression, unplanned pregnancy status (OR 2.84, 95% CI 1.12 to 7.22), C3 hypocomplementemia (OR 5.46, 95% CI 2.30 to 12.97) and 24 hour-urinary protein level (0.3≤protein<1.0 g/24 hours: OR 2.10, 95% CI 0.63 to 6.95; protein≥1.0 g/24 hours: OR 5.89, 95% CI 2.30 to 15.06) were selected for further analysis. Table 3 shows the B regression coefficient estimate in the multivariable analysis model. Using the method described above, the result of the Hosmer-Lemeshow test was p=0.325 (χ2=4.652, df=4) and Omnibus test was p<0.001 (χ2=66.255, df=4), which indicated that the logistic regression model had a good fit. The AUC was 0.829 (95% CI 0.744 to 0.914, SE=0.043, p<0.01), which indicated that the model has good discrimination (figure 1). The 10-fold cross-validation for this model was 90.0% accurate. ROC curve of the prediction model. ROC, receiver-operating characteristic. 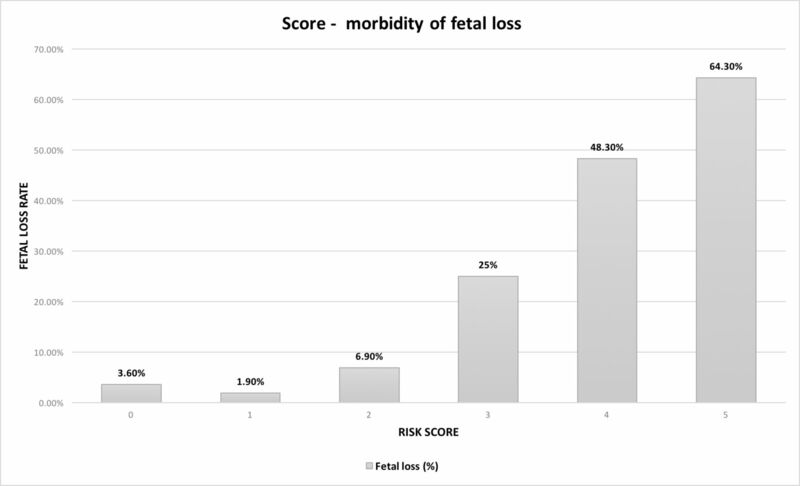 Figure 2 shows the cumulative risk score and the associated risk of fetal loss in pregnant patients with SLE. As shown in the figure, the fetal loss rate generally increased when the risk score rose. Fetal loss risk in pregnant patients with SLE based on their cumulative risk score. SLE, systemic lupus erythematosus. ROC curve coordinates and potential cut-offs for the risk score system were estimated using a detailed process shown in online supplementary tables S3–S6. 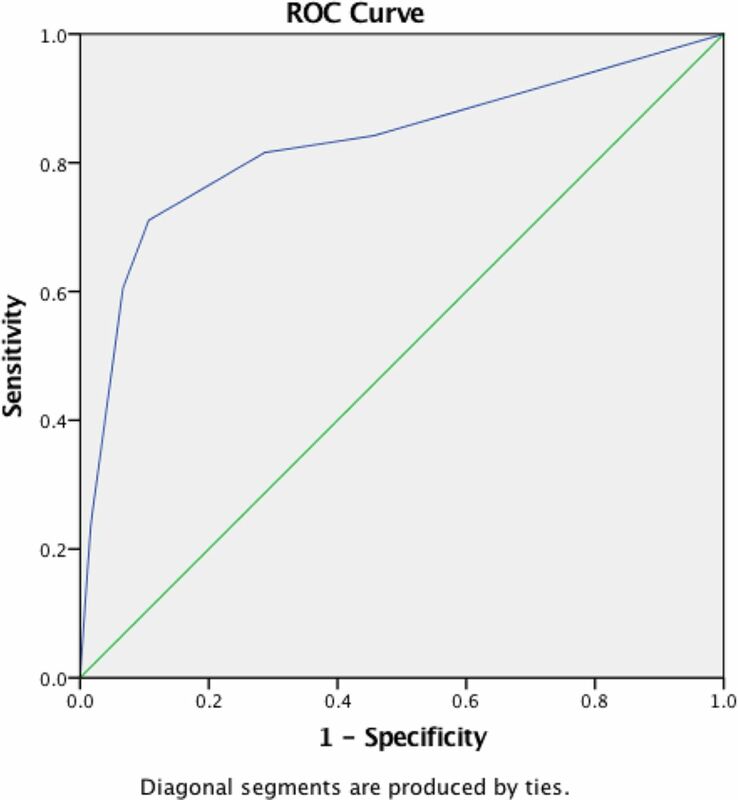 A score of 3 was the best cut-off point (sensitivity=60.5%, specificity=93.3%, accuracy=89.6%, positive predictive value=53.5%, negative predictive value=94.9%, positive likelihood ratio=9.03, and negative likelihood ratio=0.42). The risk classification for fetal loss according to the risk score system is shown on table 4. For example, a pregnant woman with SLE who went to antenatal care at 18 weeks was diagnosed with new-onset SLE during pregnancy (1), had a lower C3 complement level (2) and had a 24 hour-urinary protein of 0.8 g/24 hours (1) would have a cumulative risk score of 4, which belongs in the high risk for fetal loss group. In this study, we showed that pregnant women with SLE have a high risk of adverse fetal outcomes, including fetal loss, preterm births and LBWs. Unplanned pregnancies, hypocomplementemia C3 and an elevated 24 hour-urinary protein level were independent risk factors for fetal loss after adjusting for possible confounders. Patients can be classified into different risk groups based on the values of these three variables, which may help obstetricians and rheumatologists predict pregnancy outcomes. Fetal loss rates have ranged from 3% to 43% in prior studies.8 10 11 13 14 31 33 Our total fetal loss rate was 11.2%, which falls at the lower end of what was reported in the literature. Two other recent Chinese studies reported a relatively low rate of fetal loss.10 13 Whether Chinese patients with SLE have a lower fetal loss rate than those from other ethnicities requires further study. Our data showed that in the univariate analysis, unplanned pregnancies, hypocomplementemia C3and 24 hour-urinary protein levels improved our outcome predictions better than other variables and were selected by stepwise regression models. These three variables were stronger predictors of the overall risk of fetal loss. Clowse et al reported that regardless of SLE activity, low complement levels during the second trimester were associated with a higher rate of pregnancy loss and preterm births.9 Few studies observed an association between fetal loss and 24 hour-urinary protein level, which is a very easy and practical laboratory test to perform. Our study first compared 24 hour-urinary protein level as a continuous variable and found it to be significantly higher in fetal loss group. When performing the multivariable analysis and developing our risk score, we converted 24 hour-urinary protein level into a categorical variable based on clinical practice, which was as follows: urinary protein <0.3 g/24 hours; 0.3≤urinary protein <1.0 g/24 hours; urinary protein ≥1.0 g/24 hours.29 The presence of urinary protein ≥1.0 g/24 hours was a strong predictor of fetal loss, even in our multivariable analysis. Other studies reported that the presence of active lupus nephritis increased the risk of fetal loss.5 6 11 34 However, few studies failed to observe an association between lupus nephritis and fetal loss.10 14 35 A Chinese retrospective study of 111 pregnant patients with SLE found that proteinuria was a predictor for fetal loss in a univariate analysis, but was not associated with fetal loss in a multivariable analysis,13 a finding that may be due to the small sample size. SLE activity during pregnancy is a well-known risk factor for a poor fetal outcome. Teh et al found that SLE flares contributed to 60.0% of fetal losses in Malaysia.12 Zhan et al also reported that patients with active lupus had a 12.4-fold higher risk of fetal loss in a retrospective study of 263 pregnant patients with SLE.8 Ku et al found that patients with new-onset SLE during pregnancy had a significantly higher rate of fetal loss (73.7% vs 15.6%, p<0.01).14 Lateef et al suggested that optimal disease control for at least 6 months prior to conception should be ensured to reduce the risk of fetal loss.36 In our study, we divided patients into planned and unplanned pregnancy groups based on conception timing, which we believe to be easier and more practical for clinicians to use. Our results were consistent with those of previous studies. Nevertheless, our study has some limitations. First, as there are limited pregnancies in patients with SLE, the development and validation process of this model has to apply to the same cohort. Although 10-fold cross-validation was performed and had a good result, it still cannot assess the generalisability of this model. It would be better to have an external validation in the future.38 Second, as a retrospective study, this study has inherent information bias. Finally, clinical records lacked additional details regarding baseline population characteristics, such as education level, body mass index, family income and so on. These factors may be confounders in this study. In future, a prospective study will be conducted and more patients will be recruited for further analysis to validate this predictive model. Moreover, since pregnancy is a 10-month process, the relationship between pregnancy outcome and the trend of laboratory parameters rather than a single time point result need to be further explored. Finally, the effects and safety of different kinds of medicine will be further observed and elucidated in pregnant women with SLE. The predictive model proposed in this study permits a quick and high quality estimate of the risk of fetal loss among pregnancies with SLE at their first antenatal care visit (16 W-20 W), which is an essential step in SLE antenatal care. Identifying a high-risk group, strengthening monitoring or/and intervening at an early gestational stage may potentially improve fetal outcomes. WHO. Aspects of low birth weight. Report of the expert committee of maternal child health. WHO Technical Report 1961;217:3–16.
. Increased risk of adverse pregnancy outcomes for hospitalisation of women with lupus during pregnancy: a nationwide population-based study. Clin Exp Rheumatol 2010;28:49–55. W-HZ and WD contributed equally. Contributors JW, JM, CB, JL, W-HZ and WD were each responsible for the conception and design of the study. JW, JM and WD had full access to all of the data in the study. JW and JM collected the data. JW, JM, JL and W-HZ analysed and interpreted the data. JW drafted the initial manuscript. W-HZ., CB, JL and WD revised the manuscript. All authors read and approved the final version of the manuscript. Funding The work was supported by funding from Shanghai Municipal Commission of Health and Family Planning (Grant nos. 2017ZZ02016 and 15GWZK0701).